"Are you looking for charcoal or charcoal briquettes in Cyprus? Are you a professional (restaurant, take away tavern etc.)? We have all the solutions for you. Whether you are looking for lump wood charcoal or long lasting charcoal briquettes, we can provide you!" LAVRA CHARCOAL IS MADE FROM THE CASUARINAS TREES WHICH IS HARD WOOD AND MAKES A FINE CHARCOAL FOR BBQ BOTH FOR THE PROFESSIONAL AND THE CONSUMER. LAVRA CHARCOAL IS HIGH IN DENSITY, LIGHTS EASILY HAS A LONG BURNING TIME AND HIGH TEMPERATURE. LAVRA CHARCOAL CAN BE FOUND IN A LOT OF STORES IN CYPRUS. ΤΑ ΞΥΛΟΚΑΡΒΟΥΝΑ ''ΛΑΒΡΑ'' ΕΙΝΑΙ ΑΠΟ ΔΕΝΤΡΟ ΚΑΖΟΥΑΡΙΝΑΣ ΑΠΟ ΤΟ ΟΠΟΙΟ ΦΤΙΑΧΝΕΤΑΙ ΥΨΗΛΗΣ ΠΟΙΟΤΗΤΑΣ ΚΑΡΒΟΥΝΟ ΓΙΑ ΕΠΑΓΓΕΛΜΑΤΙΕΣ ΑΛΛΑ ΚΑΙ ΓΙΑ ΜΠΑΡΠΕΚΙΟΥ ΣΤΟ ΣΠΙΤΙ. ΑΝΑΒΕΙ ΕΥΚΟΛΑ, ΕΧΕΙ ΜΑΚΡΑ ΔΙΑΡΚΕΙΑ ΚΑΙ ΥΨΗΛΗ ΘΕΡΜΟΚΡΑΣΙΑ. ΤΑ ΚΑΡΒΟΥΝΑ ''ΛΑΒΡΑ'' ΔΙΑΤΙΘΕΝΤΑΙ ΣΕ ΣΥΣΚΕΥΑΣΙΕΣ ΤΩΝ 5 ΚΑΙ 2,5 ΚΙΛΩΝ ΚΑΙ ΜΠΟΡΕΙΤΕ ΝΑ ΤΑ ΒΡΕΙΤΕ ΣΕ ΔΙΑΦΟΡΑ ΣΗΜΕΙΑ ΠΩΛΗΣΗΣ ΣΤΗΝ ΚΥΠΡΟ. 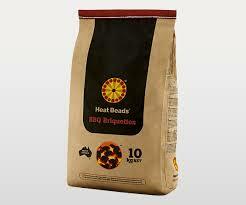 HEAT BEADS BBQ BRIQUETTES ARE AUSTRALIA'S NO1 BBQ FUEL. HEAT BEADS HAS BEEN IN CYPRUS FOR 25 YEARS WITH A CONSISTENT AND SUCCESSFUL PROVEN SALES RECORD. HEAT BEADS IS BEEN USED IN CYPRUS BY A LARGE PERCENTAGE OF RESTAURANTS, TAKE AWAYS, TAVERNS ETC. CHARACTERISTICS OF HEAT BEADS BRIQUETTES ARE THE LONG TIME (6HOURS) OF BURNING TIME, AND THE HIGH COOKING TEMPERATURE. SAWDUST CHARCOAL BRIQUETTES HAS BEEN USED IN CYPRUS FOR SOME YEARS. 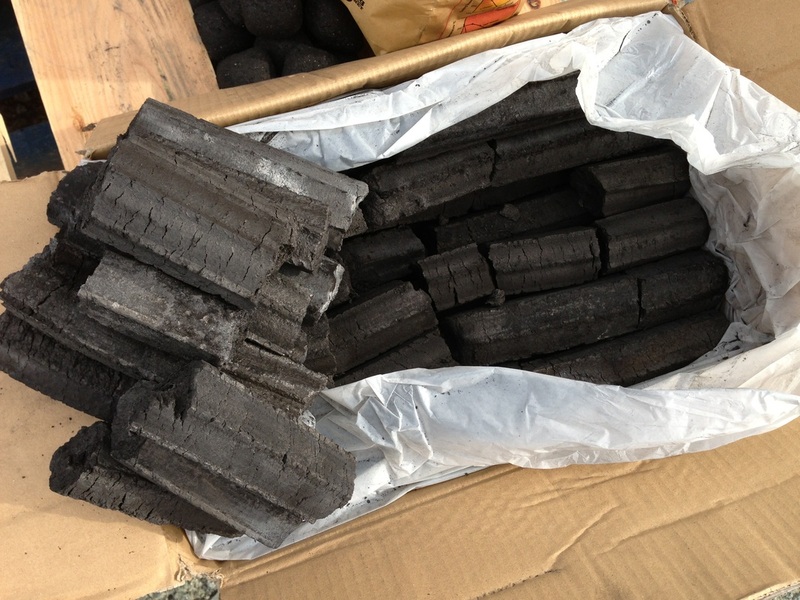 SAWDUST CHARCOAL BRIQUETTE IS HIGH IN DENSITY AND HAS A VERY LONG BURNING TIME, MORE THAN 5 HOURS. IT IS AN EXCELLENT CHOICE FOR A PROFESSIONAL. Η ΕΞΑΓΩΝΗ ΜΠΡΙΚΕΤΤΑ ΚΑΤΑΣΚΕΥΑΖΕΤΑΙ ΑΠΟ 100% ΦΥΣΙΚΟ ΞΥΛΟ ΚΑΙ ΔΕΝ ΠΕΡΙΕΧΕΙ ΚΑΝΕΝΑ ΣΥΝΘΕΤΙΚΟ Η ΠΡΟΣΘΕΤΙΚΟ. Ο ΜΟΝΑΔΙΚΟΣ ΤΡΟΠΟΣ ΠΑΡΑΓΩΓΗΣ ΤΗΣ ΠΡΟΣΦΕΡΕΙ ΠΟΛΛΑ ΠΛΕΟΝΕΚΤΗΜΑΤΑ ΟΠΩΣ ΜΑΚΡΑ ΔΙΑΡΚΕΙΑ, ΠΕΡΑΝ ΤΩΝ 5 ΩΡΩΝ, ΕΙΝΑΙ ΑΟΣΜΗ, ΚΑΙ ΕΧΕΙ ΥΨΗΛΗ ΘΕΡΜΙΚΗ ΑΞΙΑ. 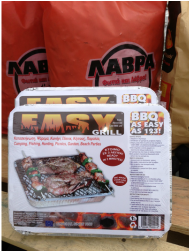 EASY GRILL IS A DISPOSABLE / INSTANT GRILL OF OUR OWN PRODUCTION. ITS UNIQUE PRODUCTION METHOD MAKES IT THE ONLY ONE WORLDWIDE THAT LIGHTS IN JUST 2 MINUTES!